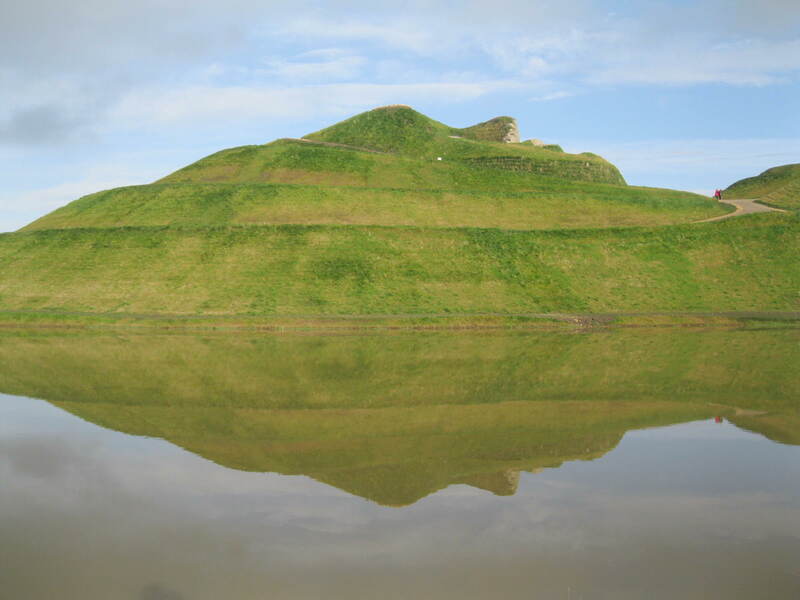 Northumberlandia, or the Lady of the North. A Goddess from a disused coal mine, Northumberlandia is a massive public sculpture in Cramlington, Northumbria. She is 100 feet high and over a quarter of a mile long. Like ancient earth works before her, she can only be seen all at once from an arial view. But you can walk around the spiralling, twisting paths that traverse her body. We went the week after the sculpture had opened to the public in September. Two helpful volunteers greeted us, and there were a few walkers with their dogs and one family on the many footpaths that wind over the sculpture. They pushed a relative in a wheelchair around the ramping paths; almost all of the sculpture is accessible, and the grades of the paths marked at the outset. The site builders worked with Disability North to make sure the site could be used by visitors of differing abilities. The first time I saw a photograph, sent to us by my father in law, I was profoundly moved but the idea of her. M and I decided immediately to go and check it out when it opened. Walking the sculpture, one catches glimpses of the working mines surrounding her, giant yellow machines toiling away in their Mordor. The information in the press release claims that coal mining has made this sculpture possible– ah, paradoxes, big money moving around. The permission to build this was granted along with permission to open the largest surface mine in England, and the sculpture itself was made from the by products of this mine. Despite my mixed emotions about this, there is something visionary about bringing life and beauty to the blighted landscape. No one seems to know about it, and the press features mostly a shrugging public. 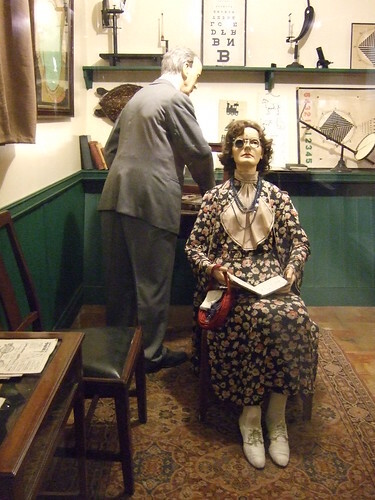 The Daily Mail and even the BBC snickeringly called it a “naked lady” and locals call her “Slag Alice”. She is the green giant in the land of the “Page Three Girl” and she is sublime, subversive, even. Comparisons to Gormley’s Angel of the North have been made– she has been referred to as the Lady of the North. While Gormley’s rusted messenger has always seemed too hard, forlorn and defensive, this piece luxuriates in the history and landscape of the North. To see the world in a Grain of Sand, the poetic insight of William Blake, is to find relationships between the big and small, science and spirituality, the universe and the landscape. This cosmic setting provides the narrative for my content-driven work, the writing and design. I explore metaphors that underlie both growing nature and the laws of nature, parallels that root us personally in the cosmos as firmly as a plant, even while our mind escapes this home. You can walk into her forehead. 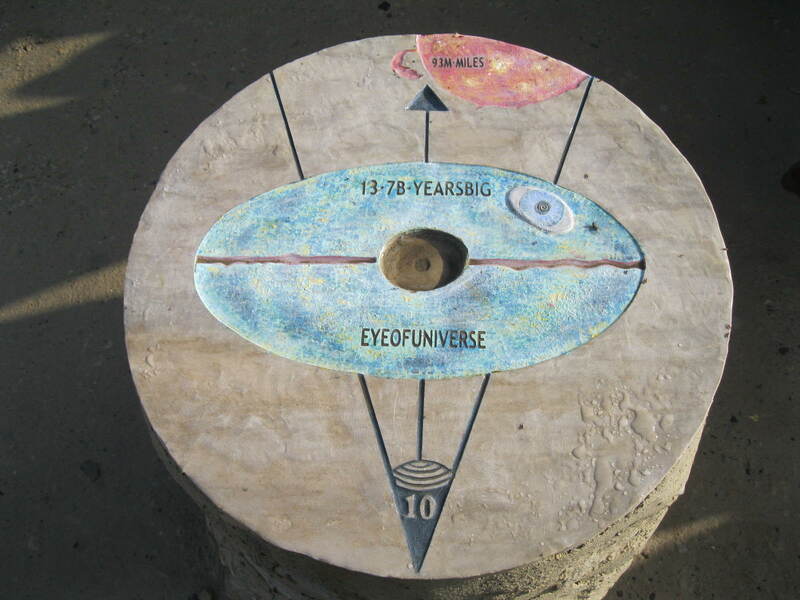 She even has a third eye, marked the “eye of the universe”. One hand points to the two spirals in her earth-sky, the other points to her feet– in the pagan blessing– as above, so below. Plaque at the forehead of the Lady of the North. For jewellery inspired by pagan landscapes, please visit my Etsy shop. 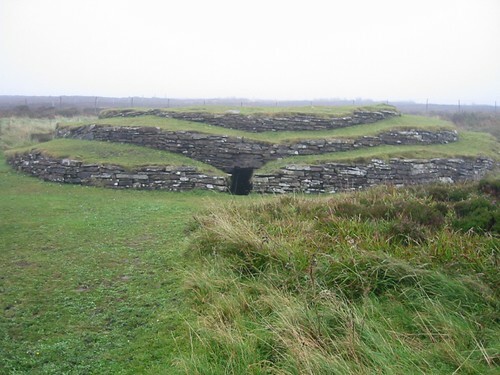 On the island of South Ronaldsay, Orkney, there is a passage mound called the Tomb of the Eagles. It’s called this because several sea eagle talons were found inside along with the remains of over 300 people. What makes this site distinct is the fact that it was excavated by a farmer who had waited 18 years for the officials to do it, and, after finding a passage in the law that allowed him to legally do it himself, he took matters into his own hands, seeking the advice of archaeologists who were excavating a nearby site. What this means is that the visitors center is staffed with people who are personally involved with education, actively reading the newest research on Mesolithic people and sites. It is a labor of love for the farmer, Ronnie Simison and the guides in the center. They have done their best to make the cairn accessible– even providing wellies and waterproof coats and trousers if the weather is proving to be dismal, which it was when we visited. Also at the site of the tomb itself a skateboard and rope are provided for those who can’t or won’t crawl in. What I liked most about this place wasn’t just the ‘tomb’ itself, which was as breathtaking in its construction as the others we’d seen, but the trust put into the visitors to value and respect the site. Me in the ‘tomb’ in rain gear provided (free) by the visitor centre. While we were at the tomb there were a handful of other visitors, but no official tour guides. You get to experience the place without any official narrative, and you must make your way inside on your own terms. There were a few people who refused to go in (women who were dressed in high-heeled boots and expensive coats). When I crawled in I heard others behind me say, “She’s just crawling in there!” and not long after, others followed. 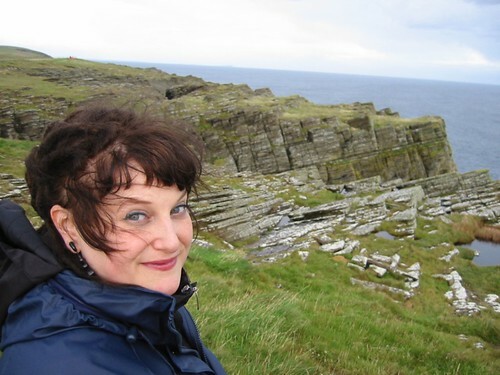 There was something humbling and empowering about the site– situated on the wild, windy cliffs of the island– I felt a little of the eagle-character of those ancients rub off on me. 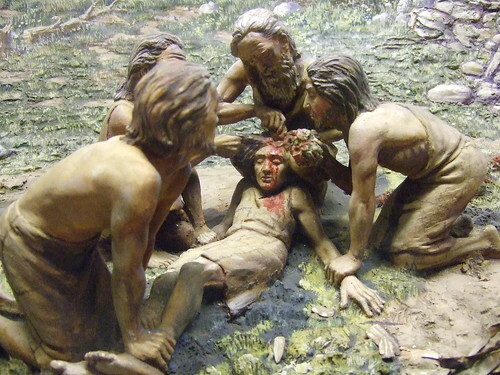 Most of the people crawling into the tomb that day were grey-haired women, and a few men they’d brought with them. How alien these women would have seemed to the people that built this place, most of whom would have been teenagers. I had this warm feeling for these hardy women who were willing to go into the darkness, and also for this archeological center, the vision of one generous farmer, where everyone is treated as a potential antiquarian. Years ago I walked the labyrinth of Chartes. I didn’t go on my knees, which would have been the authentic way, but I wasn’t alone walking it. There was a woman on crutches behind me and I just thought that doing it on my knees would have been in bad taste. But before I belabor this too self-consciously, let me make my point– sometimes crawling is the only way to go. The narrow passage of Wideford Hill. Such is the case at the many portal “tombs” across the Orkneys, the most famous of which is the spectacular Maes Howe. Though archaeologists call these structures tombs, very few remains have been excavated from them– in some, none at all. The word “tomb” as been a reductive name for these structures that were more most probably sacred– perhaps calendar machines, astronomical observatories, or sites of shamanic seclusion. This argument has been put forth in the compelling and fantastical Uriel’s Machine. Like Robert Graves’ The White Goddess, it is more wish than fact, but with so much prehistory, this is what we have to go on, and it is enough. 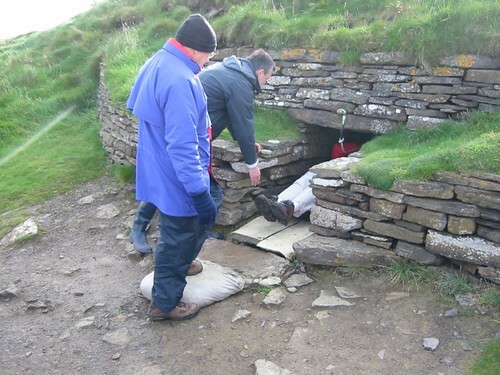 Now that Skara Brae (a stone-age, subterranean village) and Maes Howe are World Heritage Sites, tourists are herded in and jokes are made about The Flintstones and Vikings, who used the tombs as hide-outs, having a “lads night in”. 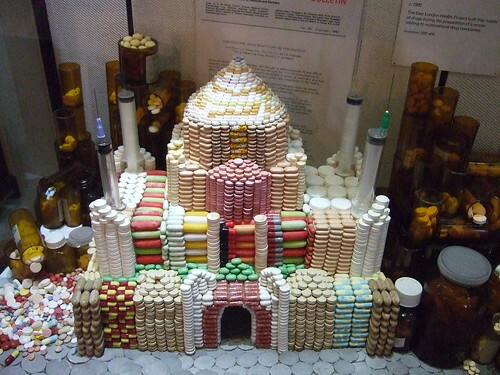 These distinctly spiritual places are reduced to fun-facts and family entertainment. The official line is that these were, basically, stone age mausoleums. To the predominantly Christian world-view that currently describes these sites, the lives of these people who built these places resemble our own lives in the most narrow way, and their ideas of the cosmos are reduced to naive superstition. 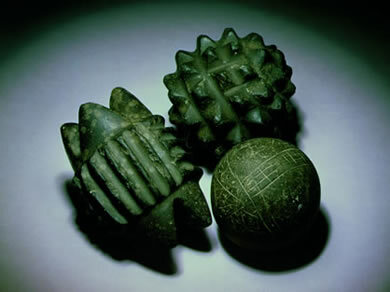 For instance, these are “stone things” found at Skara Brae. 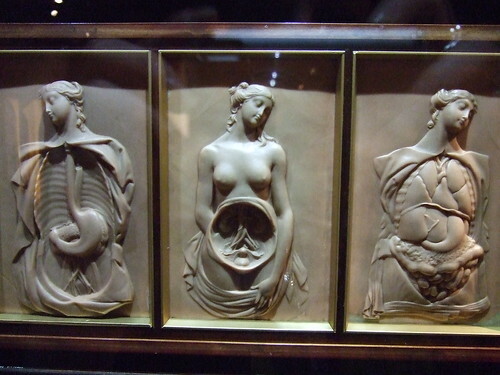 These are in a display case at the site. The viewer is not reminded of essential ideas here– that these were made by people who we have considered to be cavemen. And they were made without stone tools. These powerful objects and indeed verything about these sites argues that they are more mysterious and alien than what the official Scottish Heritage line will let on. The chambered cairns were designed to be entered via a “creep” or narrow passageway in the earth. The womb analogy is inevitable here, though in all the writings on the subject I have read, only Julian Cope seems to notice this. And, with all due respect for his tireless work on increasing awareness of Neolithic pagan heritage, he sees Mama in everything. This is the moody and charming Wideford Hill cairn. Unlike the other cairns we visited, this creep was too narrow to crawl through. One must climb in from the top, where the cairn was busted open durning (Victorian era?) excavation. But for those visitors who are not content to be merely bussed to the major sites and herded around the perimeter, there are myriad cairns that can be explored on their own terms. Using an OS map, M and I were able to locate several, each with its own kind of darkness. Outside each cairn there is a wooden box containing a torch whose batteries are either dead or dying. But it’s the ritual of crawling that gives the place meaning– knowing that everyone who entered (save the brutal Victorian archaeologists or Viking raiders who came in through the top) had to do it on all fours. 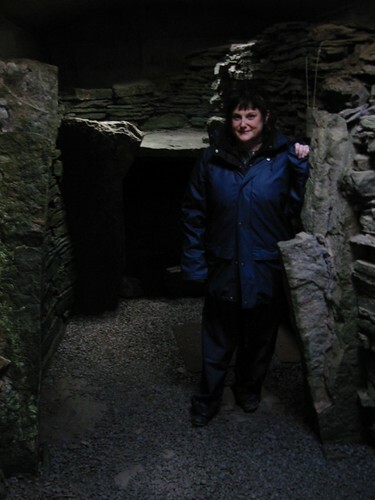 Here I am in the Fairy Knowe, or “tomb of a dog cult”– 24 dog skulls were found inside, but only 7 human skulls. This cairn was on Cuween Hill, just up the road from our cottage. The stone-age masonry– like at Maes Howe– is amazing. You can see it behind me. 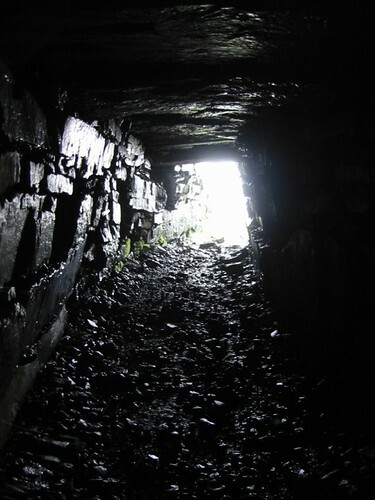 The creep of Fairy Knowe is 18 feet long– I scampered in and found the darkness warm– the shadows ocher colored. Inside was a feeling of safety, and wild information there for the taking, if one were to crawl further into one of the rooms. But I didn’t. You really have to be ready to do that, and I wasn’t. But tomorrow…what happens when a farmer excavates a tomb himself? And what does this have to do with pensioners on skateboards?